Limited to 500 copies in cornflower blue vinyl! Another stellar journey into Marc Mac's cosmic soul as Nu Era. This time across a 5 track EP, Marc imagines a futuristic meeting of soulful techno in a head on collision with 70's fusion and 80's electro boogie. 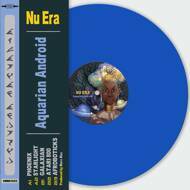 Nu Era explore vintage machines and synthesis in a way few producers do, always providing experimental electronic music without leaving you cold. Following on from the "Geometricks EP" earlier in 2017 the packaging completes an all round well presented record.